Ever since Ken Auletta’s New Yorker article on ebooks last spring, it seems like discussions on the topic among librarians have stepped up a notch or two. In fact, things are moving so quickly that an online summit (or “webinar”) called Libraries: The Tipping Point was held late last month in an attempt to hash out just how the ebooks phenomenon will ultimately affect libraries. What seems to be intended by the term “tipping point” is something like this: though print will obviously remain the dominant medium for some years to come, we’re getting close to a peak for print with a simultaneous shift to electronic publishing. I was lucky enough to be able to sit in on the webinar. Participants were exposed to lots of ideas, and what follows are just a few things which I found particularly useful or insightful. First off, I suppose a lot of librarians wonder if there are any measures of the real impact of ebooks upon libraries? The answer is that there isn’t much effect yet, but a far deeper and more profound one is believed to be just around the corner. According to Ian Singer, a VP for Media Source, Inc., who welcomed us to the webinar, library circulation of ebooks is up — increased 36% last year — and it’s anticipated that ebooks circulation will go up even more dramatically in the next few years — perhaps 150-200%. Ray Kurzweil, an inventor and futurist who has been a pioneer in optical character recognition, delivered the keynote address. Placing considerable emphasis upon the notion that information technology grows exponentially — much like the argument Alvin Toffler made about social change in his much-read Future Shock many years ago — he argues that the technological feasibility of ebooks (for such things as interactivity and processing power) is today far greater than it was just two or three years ago. Kurzweil has helped develop Blio, a new, free of charge e-reader application introduced earlier this year, which can be used with numerous platforms. Working with Charlotte-based Baker and Taylor, a major distributer of books, video and music products to libraries, there are plans to release a version of Blio for libraries next year with a million titles, many of which are public domain, though some will be newer books that users will purchase. Kurzweil believes that business models which rely upon copyright must be preserved, but he foresees “an era of more flexibility” in which the “copyright wars” will be resolved. Of the speakers who followed Kurzweil, I found the viewpoint of Michigan librarian Eli Neiburger most intriguing, though a little scary for library professionals. Going forward, he foresees a “bleak scenario” for libraries owing to the fact that they are so heavily invested in an increasingly outmoded technology: the codex. Neiburger’s take is that libraries are literally “book temples” with values and physical facilities built around the codex. Consequently, he sees the value of libraries as “rooted in the worth of a local copy.” But, in the electronic world, he says, there’s no longer a difference between transmission and duplication. For Neiburger, the local copy concept therefore no longer makes sense, because waiting for a digital object doesn’t make sense. The position Neiburger has on the past and future of libraries reminds me of Tim Spalding’s (creator of LibraryThing) critique on how ebooks call into question the traditional role of libraries as “aggregators” of information. That is, libraries have found their raison d’etre﻿ by 1) bringing information together in one convenient physical location, and 2) making possible multiple uses for a single use price. Both Neiburger and Spalding would no doubt agree that ebooks, because they’re in cyberspace, break through the traditional physical barriers of brick and mortar libraries. Ebooks in fact challenge the necessity of a whole host of things librarians have seemingly always done: checking-in, checking-out, reshelving, processing and replacing materials, etc., etc. The difference of course is that while Neiburger may be convinced that transmission and duplication are the same, for publishers and authors the control of copyright and/or digital rights is obviously essential to their survival. Spaldings’ view here is more to the point: the real crux of the issue is how libraries will survive in an ebook environment where they are not likely to receive multiple uses for a single use price. Users of Greensboro Public Library’s ebooks available through Overdrive’s North Carolina Digital Library are no doubt familiar with the problem: when you want a popular title, you usually have to make a “hold request.” In essence, a print model for holds is artificially superimposed upon the ebook model. Waiting may not make sense for transmission of a digital object, but there really seems to be little alternative if authors and publishers are going to make money. There was lots more at the webinar, but I think the idea most important for libraries is that we’re going to have to find and maintain a niche in a rapidly evolving information eco-system — if we don’t, we won’t survive. Libraries of the future may need to focus more upon resources which are unique to them and their communities, such as special collections of imprints and manuscripts pertaining to local history and genealogy. Similarly, we also need to be on watch for new opportunities in information services; for example, urban libraries could develop resource centers focused upon the “New Urbanism” trend toward downtown redevelopment and “walkability” — i.e., the idea that everything you need (work, groceries, entertainment, etc.) be within easy walking distance. And areas where libraries excel, such as children’s programming, will have to be pushed even harder. Anyway, a follow-up webinar on ebooks is planned for April of next year. 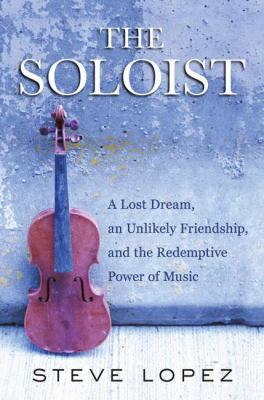 In case you don’t know, Steve Lopez’s The Soloist, the story of a homeless, African American man of prodigious musical talent but beset by schizophrenia, is Greensboro Public Library’s One City, One Book choice this year. We will be showing “The Soloist,” starring Robert Downey, Jr and Jamie Foxx, Thursday, Sept 23 at 2:30 at the Kathleen Clay Edwards Branch (1420 Price Park Rd). On Saturday at 3 pm, see “Eternal High,” a movie about a 16-year-old boy who documents, over the course of a year, his experience with depression and suicidal urges. Hemphill Branch Library (2301 W. Vandalia Road). The play doesn’t open until October 12, but it is not too early to order your tickets. It runs October 12-17. All performances are at 8 pm except for a Sunday matinée at 2 pm. Tuesday, Oct. 12 is Pay-what-you-can.” All other performances are $7.50. Call (336) 272-0160 to reserve your seat today. N&R writer Jeri Rowe features local artist Presley Ward, aka “The Stick Man.” Mr. Ward shares his experiences as an artist who has frequently experienced homelessness. About a dozen nonprofit organizations helped plan and implement the 2010 One City, One Book and dozens of other volunteers have already gotten involved in the project. Without all of them, the project would not be possible. Also, we would like to thank the sponsors that have provided financial support: Cemala Foundation, Community Foundation of Greater Greensboro, GTCC, WUNC radio, News & Record, Friends of the Greensboro Public Library and the Greensboro Public Library Foundation. In a follow-up to our recent post on the future of electronic books and libraries, check out this neat article from the LA Times about all the innovative ways books are being transformed by technology. Apple’s new iPads, for example, have multi-media potential to create “living books” with links to pictures, videos and audio files; and a new electronic publisher called Vook (combining the words “video” and “book”) is reissuing old, out-of-print titles jazzed up with video and sound. How books are written and published is also changing. Some readers are experimenting with collaborative books in online fan communities, coming up with different story-lines for popular characters or creating totally new characters (fanfiction.net). Novels are even being written through text-messaging — one such recently discovered text-message novelist was awarded a $10,000 advance by a “real” publisher, St. Martin’s. Other developments include online swap meets for digital books (scrib.com) and social networking or book club sites such as goodreads.com. Now that anyone with an Internet connection — or even a cellphone — effectively owns a digital printing press, the distinction between professional and amateur writers is rapidly blurring. Developments are obviously moving very rapidly. What will eventually emerge as “the new eBay of book publishing” (i.e., the dominant electronic vehicle for online publishing in much the same way as eBay has come to dominate online auctions)? I suppose that’s anybody’s guess. Similarly, it is still not clear how the mere reading of electronic books will shake out. Will we need a dedicated device like Amazon’s Kindle or Apple’s iPad to read them, or will Google — which can be accessed on any computer — ultimately dominate the future of e-books? But surely all must agree these are interesting times for the book. “Das Buch ist nicht tot!” The book is not dead. So reads a sign in old German typeface which hangs in my cube, given to me awhile back by one of my librarian colleagues. And while that sentiment may well be accurate, we’re nonetheless at the beginnings of a sea-change for the book, probably the most dramatic change since the invention of the printing press in the 15th century. For the “codex” (the basic format of the modern book with separate pages bound together, which supplanted scrolls by the 6th century AD) is at last beginning to be displaced — by a book in digital form. Late last month, journalist and media expert Ken Auletta published a much talked about article in the New Yorker which addresses the pricing of ebooks and how this has been especially influenced by competition between Amazon and Apple. Though Auletta estimates ebooks to represent no more than 3-5% of book sales at present, sales grew 177% last year and could eventually account for 25-50% of all book sales. Obviously, whoever can control the ebooks market can make a lot of money. Auletta tells a fascinating story. For the last several years, Amazon, as he recounts, has been selling ebooks which can be viewed on Amazon’s own reading device called the Kindle. It’s now estimated there may be as many as three million Kindles out there. But in order to gain market share and sell Kindles, Amazon was actually selling ebooks for less ($9.99) than they were paying for them ($13.00). Publishers felt this was too low and would eventually hurt their profits by devaluing ebooks. And they were also concerned about an Amazon monopoly. To the publishers’ rescue has thus come Apple and its much ballyhooed iPad, which, among other things, can also function as an ebook reader. Apple co-founder and CEO Steve Jobs has managed to fashion an agreement with five of the six top U.S. publishers to price ebooks at what is for them a more satisfactory $14.99. (Giving publishers control over pricing is referred to as the “agency model.”) In addition, the iPad offers a multi-media potential which the Kindle lacks — for example, with an iPad you could be reading a book and then link to an associated video clip. Also in the future ebooks equation is Google and their Google Books project. Google, as many of you will know, has digitized millions of books. Though the project, which has ambitions to be literally the largest library in the world, has become bogged down in litigation over copyright and other issues, there are nonetheless plans to open an ebooks store called Google Editions later this year. Google will allow the publishers to set their own prices for ebooks, and Google’s ebooks have the advantage of being readable on any device. How all of this will ultimately shake out (as well as how quickly) is unclear. As Auletta pointed out in a follow-up interview on NPR’s Fresh Air, Apple’s iTunes application (introduced in 2001) challenged the free-for-all/pirating culture of the internet by introducing the notion of paying for content. Now, much as with the music business, publishers are seizing upon another Apple development (the iPad) as a way to breathe a new digital life into an “old media” industry which, in order to survive, must somehow be paid for digital content. Auletta said nothing about what all this may mean for libraries. His focus was more upon the symbiotic fates of the publishing industry and independent booksellers. But there is likely to be an effect upon libraries, and it could be substantial. First of all, and though print will be the principal medium for books for at least a few more years, we have to assume that ebooks will nonetheless gradually evolve into the medium of choice for many library readers, and they will want free access to these ebooks. But will libraries be able to afford to provide new fiction and non-fiction bestsellers in digital form to its readers if they must pay publishers $10-15 for each download? Secondly, if a dedicated device such as an iPad or a Kindle is required to download an ebook, will libraries be able to buy these devices and loan them to patrons who cannot afford them? And if this proves impractical, how will libraries ensure access to ebooks for less affluent patrons who cannot afford the special devices necessary to view them? Another issue is the possibility that some publishers (or even authors themselves, bypassing publishers) may go straight to digital publishing, perhaps not even producing print editions of books. Digital publishing, as a music industry phenomenon for example, drove many retail music sellers out of business. How can libraries ensure that the same fate does not befall them and the digital divide between information haves and have-nots does not widen even further? Lastly, even if libraries are able to resolve ebook access problems, there will still be information literacy issues. Patrons, many of whom may have inadequate computer skills, must be taught how to download ebooks and use the devices necessary to view them. Of the options which libraries will undoubtedly explore in their efforts to provide access to ebooks, one will likely be the formation of consortia. Consortia afford a model whereby libraries can share costs and jointly provide access. Even now, through the NCLive network, Greensboro Public Library and most other libraries across the state of North Carolina have access to tens of thousands of full text newspaper, magazine, and journal articles, as well as books and even videos. And several thousand audio and electronic books are already available through the North Carolina Digital Library. As for the special devices needed to view many ebooks (if indeed the necessity of a dedicated device, contra Google, becomes the norm), it does seem likely that the cost of these devices should drop dramatically over time — much as other technologies such as calculators, televisions, etc. — and perhaps much sooner than we think. Here at Greensboro Public Library, information literacy is already a major focus, and each week our reference staff teach classes on how to use personal computers, the internet, Microsoft Word, and so forth. As we move further toward a future in which the use of ebooks will be commonplace, we will probably need to incorporate classes on how to use ebooks and/or dedicated ebook readers into our already intensive information literacy efforts — at least during the coming period in which virtually all of us will have to transition from print to digital. Anyway, za book may not be dead. But it’s changing mighty fast, and libraries and librarians need to start thinking about its future before events overtake them. Don’t Forget! Friends of Greensboro Public Library Book Sale Coming Up Saturday, May 1st! If you’re a booklover and want to spend your May Day having a blast, why not come to our semi-annual Friends of Greensboro Public Library book sale? 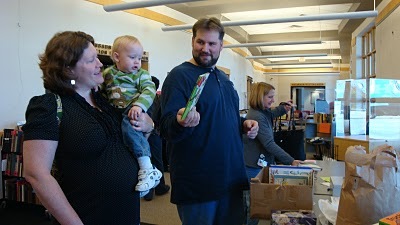 The sale is held at Central Library, located in Greensboro at 219 N. Church St., starts at 9 AM Saturday, just as the library opens, and runs until 2 PM with a bag sale to follow from 2:30-3:30 PM. You’re sure to find all kinds of great bargains! Also, while you’re here, be sure to stop by our Friends of the Library Booklovers Shop. They’ve got plenty of books at bargain prices too! And, just in case you have some “gently used” books you ‘d like to give to a worthy cause, the Booklovers Shop is where our book donations are accepted. Please, if you are donating, we’d prefer not to receive magazines, textbooks or condensed books. Tax receipts are available. Interested in the next sale? Well, mark your calendars for Saturday, November 6th. All proceeds go to the Friends of the Library. Remember, Central Library, May 1st, 9 AM. Be there or be square! Back when I was a kid in the 1960s, in the days before DVDs, video cassette recordings, and the multitude of cable television stations we enjoy today, the annual showing of the classic movie The Wizard of Oz (1939) was an anxiously awaited TV event. So much of the film has been impressed upon my memory: the feet of the Wicked Witch of the East, protruding from underneath Dorothy’s house; the tapping of the magical ruby slippers; the silhouettes of the flying monkies against a full moon; the melting of the Wicked Witch of the West after Dorothy tosses water upon her (intended for her burning broom); and last, but not least, the high-pitched voices of the wonderful munchkins as they point Dorothy down the yellow brick road. And of these last characters, the muchkins, we are saddened to hear today of the death, at age 94, of the diminutive coroner who pronounced the Wicked Witch of the East dead. His name was Meinhardt Raabe, and he was a twenty-two year old midget performer when the movie was filmed in 1938. If you’re interested, Greensboro Public Library has Raabe’s memoir, Memories of a Munchkin: An Illustrated Walk Down the Yellow Brick Road (2005), which Library Journal calls “an essential read for anyone interested in munchkin lore and The Wizard of Oz.” Mickey Rooney did the forward for the book, by the way. I know there are plenty of other folks who have fond memories of this American classic, and if you want to learn still more about the movie as well as L. Frank Baum’s famous book, try some of these: Finding Oz: How L. Frank Baum Discovered the Great American Story by Evan I. Schwartz; The Road to Oz: Twists, Turns, Bumps, and Triumphs in the Life of L. Frank Baum by Kathleen Krull (juvenile); Oz: The Hundredth Anniversary Celebration, edited by Peter Glassman (juvenile); The Wizard of Oz: Selections from the Original Motion Picture (sound recording); and The Wizard of Oz: The Official 50th Anniversary Pictorial History by John Fricke, Jay Scarfone, and William Stillman. Some Great Spring Book Sales Coming Up in Greensboro! Hey, if you’re a book collector or just love books and like to read, we’ve got a couple of great book sales coming up here in Greensboro that you will not want to miss. First of all, one of Greensboro’s best annual sales is held each April by St. Francis Episcopal Church. Back when I was a real fanatic, I used to get up at four in the morning just so I could be first in line at this one. This year the sale will be held Thurs., April 29th (10 AM-8 PM), Fri., April 30th (10 AM-8 PM), and Sat., May 1st (10 AM-2 PM). The church is located at 3506 Lawndale Drive. On the same day St. Francis’ sale wraps up (May 1st), the Friends of Greensboro Public Library hold their Semi-annual Spring Book Sale at Central Library, located at 219 N. Church in downtown Greensboro. Hours for the sale are 9 AM-2 PM & 2:30 PM-3 PM. The latter time I believe is for their bag sale. St. Francis’ sale is huge, estimated at about 50,000 volumes. Greensboro Public Library’s is not so large, but you bibliophiles will find plenty of goodies at both. While I’m enumerating local sales, I’d be remiss if I didn’t also mention the Beth David Synagogue Book Sale, but that’s a wintertime event & for the next one you’ll have to wait until January 29th-31st, 2011. If you’d like to learn more about book sales in North Carolina and elsewhere, you may want to check out booksalefinder.com.